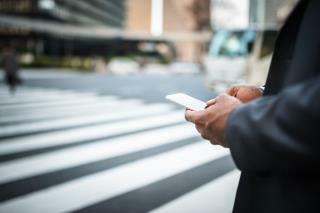 (Newser) – People in one Hawaiian city may have to say "aloha" to texting while crossing the street. * CNN reports the Honolulu City Council voted 7-2 Wednesday to bar pedestrians from looking at their mobile devices while crossing the street. The legislation applies to cellphones, tablets, video games, digital cameras, pagers, and laptops, according to Hawaii News Now. Pedestrians caught checking Facebook or sending a tweet while in the street would be subject to a fine of between $15 and $99. Fines could increase to up to $500 for multiple citations. Brandon Elefante says he got the idea for the legislation from high school students. "These high school groups were concerned for their peers being distracted while crossing the streets and looking at their phones instead of looking both ways," the councilman tells CNN. While the Honolulu Police Department supports the legislation, Councilman Ernie Martin, who voted against it, says a public awareness campaign would be a better solution. The legislation now heads to Mayor Kirk Caldwell for approval. A spokesperson for the mayor's office tells KITV that Caldwell is still deciding whether he'll approve the legislation. All cities should make this a jaywalking offense. I'm really tempted to lay on my horn when texting lallygaggers wander around in front of my bumper. Tempted, but I don't. Many people carry concealed in my region, and you never know who's going to shoot you just for tooting your horn. I'm all for fines based on stupidity. Only way offenders learn. Drivers who hit them won't have a conscience about it afterwards, as opposed to the opposite scenario, where texting drivers hit a pedestrian.